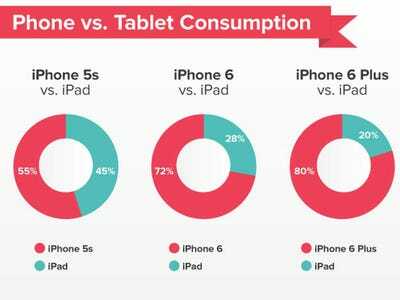 People who want to sound smart say that this doesn’t matter for Apple because the iPhone 6 and 6 Plus make more money for Apple. The iPhone sells for ~$US650. The iPad’s average selling price last quarter was $US431.66. 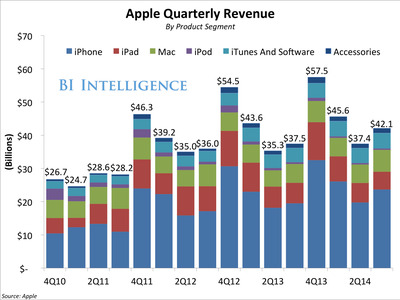 The iPhone is much more profitable. But, in an ideal world for Apple, it’s selling a $US650 iPhone, and a $US431 iPad, and a $US1,200 Mac, and a $US400 Apple Watch, and, what the heck, why not toss in a $US99 Apple TV, too. Instead, it looks like Apple will be selling a $US650 iPhone every 2-3 years, a Mac every 5-8 years, and maybe an iPad every 4 years, or maybe not, if people are buying the iPhone 6 Plus. As for the Apple Watch, who knows. So, the smart people that say this doesn’t matter are right. Apple shouldn’t care if the iPad is killed by the iPhone. It’s much better than watching the iPad get killed by a Samsung phone.